Other posts on this project: Little Apples Quilt Pt. 1. 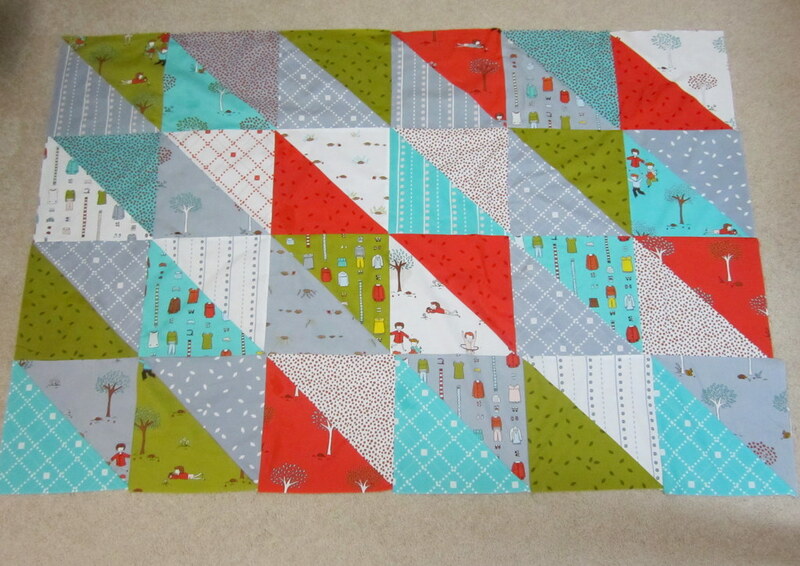 Waaaay back in November I started this quilt with Aneela Hoey’s Little Apples collection. Then it was put on the backburner as the holiday season kicked into gear, and I’ve just picked it up again this weekend. I’d already pieced these 4 rows and just needed to stitch them together, so I decided to go ahead and do that before piecing the remaining 2 rows. I love big half square triangle quilts like this, but for some reason when I pieced these rows back in November the bottom one came out really wonky. You can see how it sticks out more than an inch from the other rows on the right hand side. I didn’t notice it until I put these 4 rows together, and now I’m trying to figure out what to do about it. I don’t know if Iwas in a big hurry to get it done (it was supposed to be a fall throw after all, and there isn’t much fall left by November). Or if I cut the triangles badly. I’m going to work on piecing together the remaining blocks more carefully and see what it looks like when all 6 rows are assembled. I’ll decide then if I need to take apart the bottom row and do it over, or if the piecy, overall effect still looks pretty good. I have a suspicion it will be getting dismantled. We’ll see. But otherwise, I really like how this is coming along. Maybe I’ll even have it ready to put out this fall.